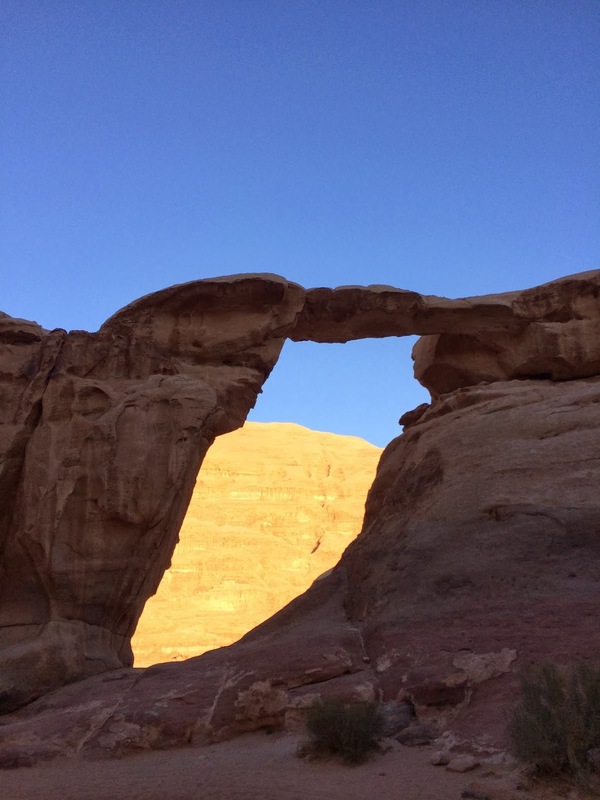 Yes, you read that right: I went to Wadi Rum again. I'm currently two months into Operation GTWREMO2014 (Go To Wadi Rum Every Month of 2014), and month three is pretty much in the bag thanks to the impending family visit. Will April happen too? It's not impossible. If I learned anything from this weekend, it's that you can never really get too much of Wadi Rum. This was a very different trip in some logistical ways: smaller group (3 guys and 3 girls), and camping in the Actual Desert instead of outside. The place itself, though, provided all the magic and majesty it had last time, and knowing what to expect didn't diminish the feeling at all. 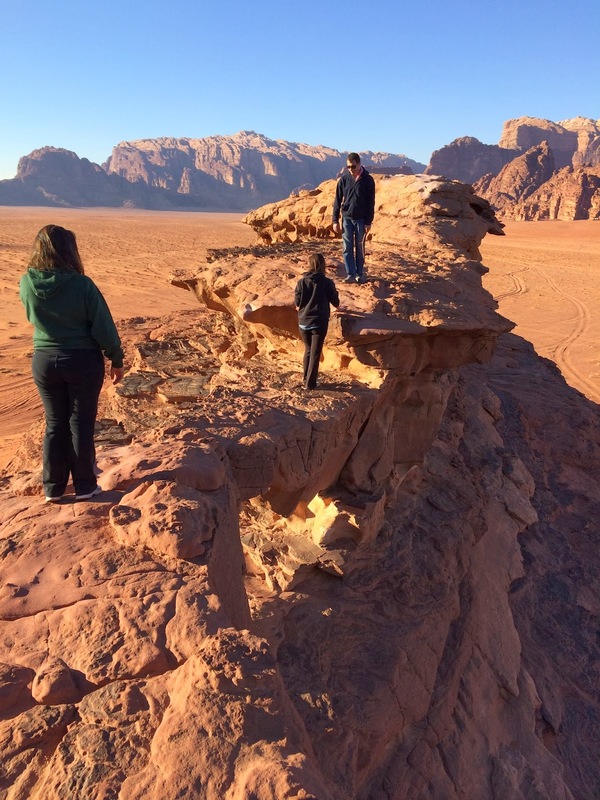 We arrived in the afternoon, sun high in the sky, and were greeted by the familiar expanses of desert and towering rock structures as we sped away from the little Wadi Rum town in the bed of a pickup truck. Lina, Mia, and Moamer exploring one of two (!) thrilling rock bridges we encountered. Check out that backdrop! The second rock bridge. It was significantly less scary being up there, I promise. This time, I made sure to take about eight thousand pictures of the sunset. Here's one of them; I'm pretty happy about the way my state-of-the-art iPhone camera caught the light. It was a transcendently beautiful thing to see, and I was sad that we weren't meditatively silent while it happened, but that's what next trip is for! Our camp, the morning after. It was really freaking cold at night and Chase kept stealing the thick quilt (we were sort of sharing a bed), but there's something so comforting about sleeping in many layers of clothing and under many soft blankets. And waking up to this sight made it so, so worth it. So a very successful trip, I'd say - our evening in the camp was a pleasant one, with a hearty dinner and tea and ghost stories and a serenade by a remarkably talented oud player and singer. I liked our guide/driver, Suleiman, and I think I'll get in touch with him about leading our March trip as well. Thanks for some beautiful memories, Wadi Rum; so glad I'll be back so soon. Since then, a thoroughly normal week; my classes are getting pretty pumped about our politics unit, so it's been fun to jump into that together, and there are some dinners and parties later this week to keep things interesting. Most exciting of all, though, is our long weekend, because early Thursday morning, we're going to JERUSALEM!!! I don't think I realized how exciting this was until this week. I've been here for an awful long time without crossing our western border, and it's going to be really nice to be back in the Old City to see sights and explore and even catch a Friday evening service. From everything I've heard, it's impractical to go unless you've got a long weekend on which to do it, so we jumped at the chance and I really can't wait. Two more days. You may not hear from me before then, because this is my only Supervised Study Hall of the week (hooray!). Until next time, enjoy these pictures, and get ready for stories of what is sure to be a blast of a weekend.